ONE of the 22 Helensburgh soldiers who received carriage clocks in recognition of their service in the Boer War went on to win praise from the King of Albania. A Lieutenant at the time of the clocks presentation in 1901, John Maxwell Gillatt rose to become a Lieutenant Colonel and was awarded the DSO and OBE. A professional soldier whose mother lived at Broomknowe, Rhu, he served in the Boer War in the Imperial Yeomanry, then transferred to the Royal Scots. He served with the West African Frontier Force from June 1907 until August 1911, and two years later he was appointed Adjutant to the 6th Battalion Royal Scots. 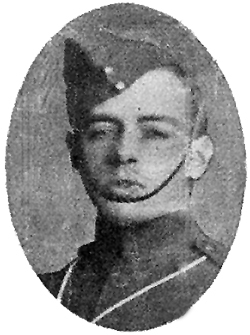 He went with the Battalion to Egypt and took part in the Senussi Campaign in 1915. The following year in France the 5th and 6th Battalions were amalgamated, and in January 1917 he was appointed to the command, with the rank of acting Lieutenant Colonel. In the following September he took over command of a Battalion of the Royal Scots Fusiliers, and in February 1918 he was appointed to the command of the 2nd Battalion Royal Scots. He was in this post for five months, in which the Battalion played a conspicuous part in stemming the German onslaught. Voluntarily resigning his command, he was posted to the Northern Cyclist Battalion, with which he served for over a year. That year he married Alice E. de St Croix, known as Peggy, whose home was in Jersey. From 1919-23 he was with the 2nd Battalion in Ireland and Aldershot, after which he was seconded for service with the Iraqi Levies, commanding in turn both the 2nd and 1st Regiment. On reaching the age limit in 1926 he retired, and was granted the rank of Lieutenant Colonel. After three years of inactivity, in 1929 he joined the Albanian Gendarmerie, and he was promoted to Colonel in July 1935. He was still serving with them at the time of his death at Scutari on January 21 1937, when he suffered a heart attack. The funeral took place the following day, when the wreaths included one from King Zog and another from the Albanian Cabinet. He had a distinguished war record, both in the Boer War and World War One, being awarded the DSO in 1918 and while in Iraq being awarded the OBE in 1928. 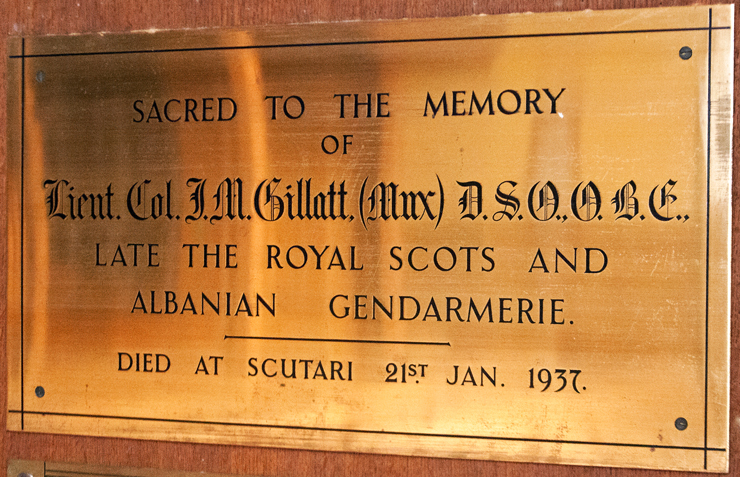 A letter from the British Minister in Durazzo, Albania, to the Foreign Office stated: “Colonel Gillatt had served long and with distinction in the British Army at home and abroad before he joined with Albanian Gendarmerie Inspectorate in 1929. His mother erected a brass wall tablet memorial (above left) to him in Rhu Parish Church beside the side door — just as she had done 26 years earlier. 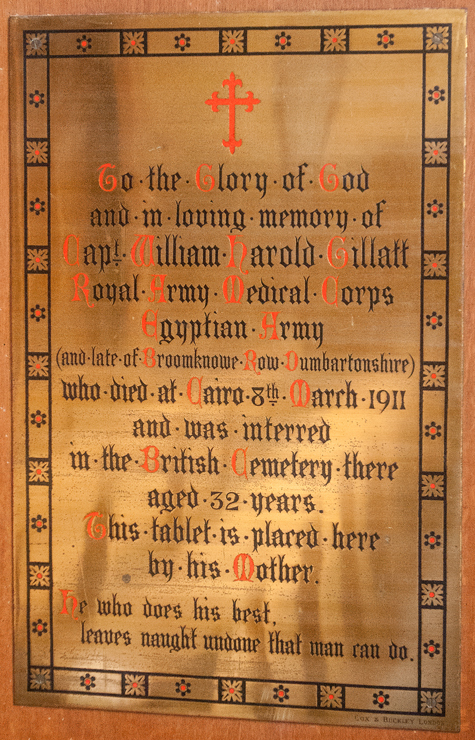 His brother, Captain William Harold Gillatt of the Royal Army Medical Corps and the Egyptian Army, accidentally shot himself in Cairo on March 8 1911 at the age of 32. The memorial to him (right) is a few inches to the left of the memorial to his brother. The only clock recipient thought to have died during the Boer War was James F.Neilson (left). Shortly after the announcement of peace on June 2 1902 came the sad news that Corporal Neilson, of the Scottish Horse, had died of enteric fever at Elandafontain the previous day. The day letters from Corporal Neilson — in which he spoke of being in excellent health — reached his burgh home, so too did a telegram from the War Office stating that he was dangerously ill. The following evening a second telegram said that he had died. 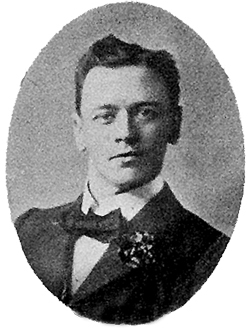 He joined the Scottish Horse in February 1901 and went to South Africa, arriving there just about the time that his brother, who had also been at the front, was leaving for home. He saw a good deal of hard fighting, and took part in the engagement when a Colonel Benson was killed. He escaped without injury in the several engagements in which he took part, but he took ill with enteric fever, which claimed many victims. He recovered, but died after a second attack. He was the eldest son of Helensburgh baker Andrew Neilson, of 114 East Princes Street, and was well known in the town, especially in Masonic circles, having been an office-bearer in the Lodge St George. He was survived by his wife and two young children. In all, 45 young town and district men served in the war by the time it finished, and the Town Council commissioned a Memorial tablet in recognition of the patriotic voluntary service of all of them. It was designed by well known burgh architect William Leiper RSA, FRIBA, builder of several iconic mansions in the town and district, and the Times described it as being of a most artistic character. After the tastefully engraved plaque was formally accepted by the Town Council it was given a prominent place in the hall of the Municipal Buildings, where it remains to this day an interesting record of the loyalty and patriotism of the burgh at a period of stress and storm in history.